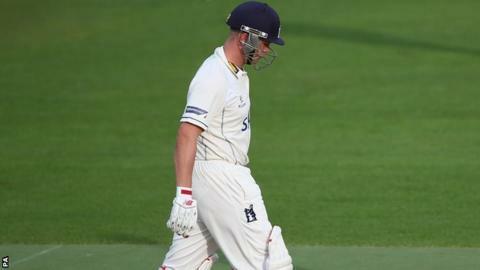 Warwickshire batsman Jonathan Trott was out cheaply against Oxford MCCU in The Parks in his first first-class innings since coming home early from England's Ashes tour. As the the Bears piled up the runs against Oxford MCCU, Trott made just 8. The 32-year-old had to wait half the day to bat as opening pair Laurie Evans (98) and Varun Chopra (71) put on 170. But, coming in at number three, Trott lasted 22 balls before becoming victim to Kent second teamer Sam Weller. Ateeq Javid (75) and Paul Best (50no) were Warwickshire's other two half-centurions as the Bears amassed 388-7 in the day. That must have added to the frustration for Trott, who also failed in a pre-season warm-up match against Gloucestershire last week at Edgbaston, making just 4. After losing the whole of the first day in The Parks to rain, Trott has just one more chance to bat on Wednesday's third and final day before the Bears, title winners in 2012, start their 2014 County Championship campaign against Sussex at Edgbaston on Sunday. Trott has scored 3,763 runs at an average of 46.45 in 49 Test appearances, in which he has hit nine centuries. But he managed 19 runs in two innings in the Brisbane Test in November, twice being dismissed by Mitchell Johnson. He has also represented England in 68 one-day internationals and seven Twenty20 matches. But Bears paceman Chris Wright, making his own comeback for Warwickshire this week after missing the second half of last season with a stress fracture in his back, insists that Trott is ready to fire on all cylinders again. "He's a great guy to have around the changing room, a funny character," Wright told BBC Sport. "And he seems to be as good as gold. There's no signs of anything playing on his mind. "We just hope we can start the season well with Trotty and Ian Bell in the team." South Africa-born Trott, in his benefit year at Edgbaston, left the Ashes tour following the first Test in Brisbane in November with what was described at the time as a "stress-related illness". Trott later explained his abrupt departure from Australia, insisting that he was "burnt out, but not depressed". But that led to criticism from former England skipper Michael Vaughan, who told BBC Sport that he felt "a little bit conned" because everyone had been "allowed to believe that he was struggling with a serious mental health issue". Following sessions with a psychologist, and a family holiday while Warwickshire went on a pre-season training camp to Barbados, Trott has set his sights on reclaiming his place in the England team this summer.